A gardener’s mind never stops thinking for new ways to make next year’s home landscape, whether it be vegetable or flower gardens, more attractive and better. We are drawn to new gadgets, glove styles, garden design ideas.. and in this case affordable electric tillers such as the Earthwise TC70001! It was this time last year (as of writing this review) I started thinking about turning my little back yard into a garden haven with a nice border of plants and flowers along the side of my yard. I spoke to landscapers, I did hours of research and I ordered and purchased books and magazines all about this stuff. In the end, I made the decision to go with my own DYI instincts and purchased an electric tiller/cultivator… specifically the Earthwise TC70001 which is conveniently available at Amazon. Although there are certainly other ones that will do a nice job as well, I know I made the best choice and if I had to do it over again, I’d still buy the same brand and model. Never short on giving my own advice and opinion when asked… okay well even when not asked… I have written out all the key points to consider when looking to purchase your own electric tiller and then you can decide if it’s worth it or not. I’m one of those right brain/left brain people, so it should be no surprise that even though I love spending money, I also equally enjoy saving money too. Had this tiller not been reasonably priced I’d have never gotten it, I’d have chosen something else. I paid less than $150 and bought it through a local home improvement store. I could have ordered it online through Amazon and would have gotten it cheaper or the same price had it not been for needing it that very weekend! I usually order most items though Amazon as we are Prime Members and get Free (and Fast!) Shipping on all items we order. When I first started my research last year I started in the Fall since because come Springtime landscapers are hard to find at that point. I called a guy out here and he was super nice and I wanted to give him business (all for supporting small local businesses). We talked about our options for how to add bushes, flowers and a vegetable garden. We talked about aerating the lawn, dumping fresh soil and peat moss and blending into the clay, tilling rows or a whole patch. The guy could do whatever I thought best. His price was typical for the work including labor, about $400. I was torn. On one hand, he gets it done and it’s over with. On the other hand, I am completely reliant on paying someone else to do something that I felt I could do myself. So ask yourself, which side are you on? Are you a DIY person? Or are you quick to get other people to do the work and gladly pay them, even if it’s more money than doing it yourself? Need a budget spreadsheet – here are some templates through Google Docs. One Time or Multiple Uses? Another logical question to ask yourself is if this is for a single one time use. I don’t mean single use for the season, I mean as in ever! An example of a one time use would be adding a flower patch in front of your house. You have no plans of expanding or doing any other flower patches… ever. Flower patches don’t have to be re-tilled either. This would be a one time use. 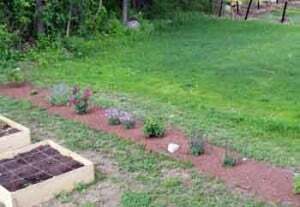 An example of mutli-use would be if you have a vegetable garden or you are usually adding beds somewhere in un-tilled soil each year. This was the category I had fit in. I knew even if hiring a person to get it started, I’d still have to work it each year. And with my enjoyment of working outside, I knew this wouldn’t be my only project. My advice? If you fit into the single one time use, get local quotes. If they are pricing your job at prices you can’t afford, then consider getting a tiller and keep reading this article b/c I go over more considerations. If they are reasonable and you can swing the payment, hire them out! Now this was a big issue for me. I didn’t want to rely on my husband or anyone else to work this machine for me. If I wanted someone else to do it, I’d have hired someone, right? When I first considered getting a tiller, I only had images of my mother and father every spring having to work it together since it was so heavy, bulky and so hard to start. What a pain. My husband treats doing outdoor work the same as going to the dentist to get a tooth pulled. So I “really” needed something I could handle on my own. I’m a petite 5 foot 2 woman. Almost approaching middle aged (considering which decade to be in the middle) and I don’t run marathons to say the least. Therefore, I needed something I could handle on my own and the Earthwise Tiller was great. First, it is lightweight, approximately 27 lbs… lighter than the pizza stone my husband wants to get! I can easily lift and carry the tiller around the yard, to and from the garage, etc. There is a convenient handle that allows for easy pick up, or you can just push it on its wheels as you would a mower. Secondly, it is not bulky. I can easily maneuver it while I am using it. When doing my own research I read how b/c of it being lightweight that sometimes it would bounce a bit if it hit a rock or what have you. I was worried that by “bounce” it would go flying out of my hands but this was not the case. It just means its not like a mower that stays one steady line, this thing has huge blades and is a powerhorse so if it hits something hard, it will give a bounce.. not a big deal. Also, I wouldn’t expect it to bounce in already broken up soil. I used it for hard rocky clay soil, so this would be expected. Another feature I like are the handles, they are ergonomically designed to hold it steady while in use and for easy maneuverability for tilting to the left or right when digging a small trench or hole. Is it a Tiller or Cultivator? Depending on who you ask you will get different answers. 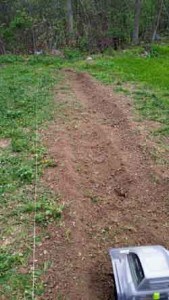 I think they need a new term such as Cull-tiller, because for my use, it “tilled” the ground, and it also cultivated the ground when I wanted to mix in compost. 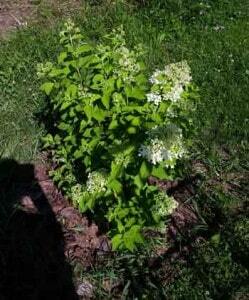 This is the hydrangea bush we planted using the tiller. I’ve used this to dig holes big enough for planting bushes such as hydrangeas (Native Ohio Limelight species above) and lilacs. I do think it would have been easier with a shovel however, not in this soil! If the soil was already loose I’d have used a shovel to dig my holes, but it isn’t here in Ohio so this came into great use for that as well. Keep in mind this is not a post hole auger, so it did take time. If you have a big project and wanting to dig holes for fence posts around your yard, go rent a post hole auger! Regardless if you purchase this tiller at a store or online, it will come in a box, not pre-assembled. Could I have put it together by myself? Probably, but I’m not great with instructions and I’m pokey. So my husband put it together in no time at all. As I mentioned, my mother who is in her 70’s got one too after using mine, she had her friend’s husband put it together. There is an option to not use the guard, however I do not recommend this. The guard helps add stability and helps keep dirt from kicking back up at you. Here is another factor to consider that will determine what kind and size tiller you get. This tiller is awesome, we know that already. But if you plan on doing a large swath of land like a farmer would do, this is not for that! 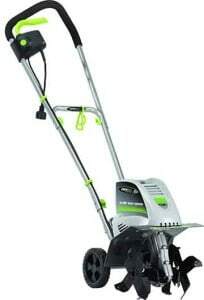 Now, I used this to do a long flower bed, plant bushes and put in a small garden next to my raised beds. I would run it easily 30-45 minutes straight and never had a problem with any type of overheating. But remember, some tools are not meant for heavy duty usage like the big guys use. For example, I used this tiller to till up my front yard (very small) so I could reseed and plant new grass from scratch. It did a great job, but would I do it again? Probably, but if my yard was any bigger I’d have figured out something else. I saw a neighbor down the street do the same thing to his yard, but he had a full size rototiller and I couldn’t see him using a small tiller like mine as his yard is considerably larger. Therefore, consider the size of the area where you anticipate using this. Obviously this is an electric tiller/cultivator. Electric tools are powered one of two ways, one is a battery and the second is a cord. Pros and cons to both however in my opinion I think the corded option is much better in this case. Battery operated is fine for quick jobs, but all batteries lose juice over time and have to be recharged and eventually replaced. From the other reviews I read and on forums I found that many users of battery powered ones had the same experience as I had with my battery powered weed whacker and blower – it just doesn’t hold the charge long enough for my needs and can be very frustrating when almost done with a project and the power just keeps draining and draining and I have to wait to charge another battery. Corded however maintains a consistent level of power and is more cost effective. This particular model is 120 volts, 60 hertz and 8.5 amp which is one of the more powerful electric ones I’ve seen out there. Regarding any negatives for the corded option, I did experience one issue with my own tiller and I’m not sure if this is due to the tiller or the cable I was using, but since there were so many rocks in my yard my tiller got quite a workout, my cable would sometimes get loose from all the movement. I simply pushed the end of the cord back in and carried on. One quick consideration here is to make sure you have an outdoor outlet if you choose to go with a corded electric tiller. You will need to make sure you have a Heavy Duty Outdoor Cord (the orange ones) that will reach. You will need to purchase this separately if you don’t already have one. We bought a 100′ cord so we wouldn’t have to daisy chain any additional ones together. One nice long cable and we were set. My mother on the other hand did connect multiple outdoor extension cables as her garden is a considerable distance away from her outlet and hers worked just fine. Cables aren’t expensive by any means, and of course this goes without saying… buy a heavy duty “exterior” cable. Another reason I leaned more towards an electric (battery or corded) was due to the smell of gasoline. We don’t have an outdoor shed and this would be stored in our garage. I didnt’ want to deal with any gasoline smells or spills. Type of Soil – Will it work in rocky soil? Will this tiller/cultivator work for very rocky yards? This depends on two things – how rocky and what kind of rock? Using it in a gravel driveway is not acceptable by any stretch, but having a few rocks here and there will be no problem. This was my biggest concern when purchasing. There is no warranty if you hit a rock and bend the blades – it pretty much tells you this is not for heavy duty use. The warranty will cover defective parts. As I stated earlier, I live in Northern Ohio where the soil is hard clay (I can’t even use a shovel unless its after a heavy and long rain), and we have lots of rocks. I did get a large rock stuck in the blades but using a hammer and screwdriver to knock it out was fine, this only happened once. My soil is so rocky that I would end up consistently stopping the tiller, unplugging it (I always unplug it if I’m going to walk in front of it), and would use a trowel or my hands to move rocks out of the way that had gotten hit by the tiller blades. If I knew my tiller hit and broke a rock, I’d stop and toss the rock out of the way. The finished flower bed thanks to my tiller. All holes were made with my Earthwise 7100. One strong recommendation is to only use this when the clay soil is dry, not wet. If you try to use it in wet conditions odds are you will only clog up the blades. This would go as a general rule of thumb for any tiller. Push start feature is great! Has a nice Cable clip to use to help keep cable in place (however you still need to be mindful of where it’s at. I always keep it over my shoulder so it remains behind me, my husband doesn’t do that when he uses it – so it’s preference. Super easy to start! No tugging on cords to start it! Simply squeeze the handle and press the green button. If you let go, the machine stops immediately. I love that safety feature. Smart hand grips – as stated earlier I understand why the design is as it is – it makes it super easy to tilt the tiller to the right or left and is still nice for moving forward or backwards. Plus they are padded. Excellent design choice. Top grip for moving. You’ll see in the picture how easy it is to pick up and move this tiller. It is not awkward or difficult. Remember, I’m 5’2, so if I can move this baby around with easy, most people can. 11 inch cutting width. Most cultivators I found are smaller, with smaller cutting widths. I wanted mine as big as possible. 8.5 inch cutting depth. This was a key reason for picking this particular tiller. Most other ones I looked at, and especially in this reasonable price range, would only 5-8 inches deep. This one I was able to dig deeper where even those extra few inches made quite a difference. They have a basic 2 year warranty on defective products and parts. If you want to claim any of this you must show proof of purchase so keep your receipts in a folder somewhere just in case. However it won’t cover things like, leaving it outside and then whoops, the rain got into the motor and now it won’t work… duh. Or using the machine as it isn’t intended, like my gravel driveway example above. Most of it is common sense, but when you go here to read more online at Amazon, they actually have a PDF of the one page warranty. I purchased mine at a local store at a great price. You can do the same “if” they have any in-stock and carry it. Not all stores do. I saw another local hardware store that was also selling another brand at a higher price and it was not even close to the Earthwise tiller I’m writing about. Anyhow, you can order it through Amazon or at least learn more about it and read reviews. If you have a Prime Membership, then you will get free shipping and it will probably arrive within just a few days depending on where it is shipping from. Amazon is also great to work with in regards to returns – we’ve returned defective DVDs, food we didn’t like, etc. They have great service and as long as they keep it up, they’ve got a lifetime customer with us. Full disclaimer, I am an affiliate for Amazon, and I put my written word where my mouth is, therefore I don’t recommend anything I would not use. So to prove it, I’ve posted pictures of me with my tiller throughout this article. Thanks and I hope my review in some way helped you determine if the Earthwise TC70001 is right for you or not!